Which states are the most paternalistic, in terms of telling you what you can and can’t do? Which states tax individual choices like gambling, smoking, or using plastic bags most heavily? This infographic ranks the states according to how much their tax codes distort individual choices in private markets. The ranking shows which states try to control your choices by taxation, and which ones leave the choices up to you. Paternalistic policies may have positive effects that are easy to see, but they also have hidden unintended consequences. 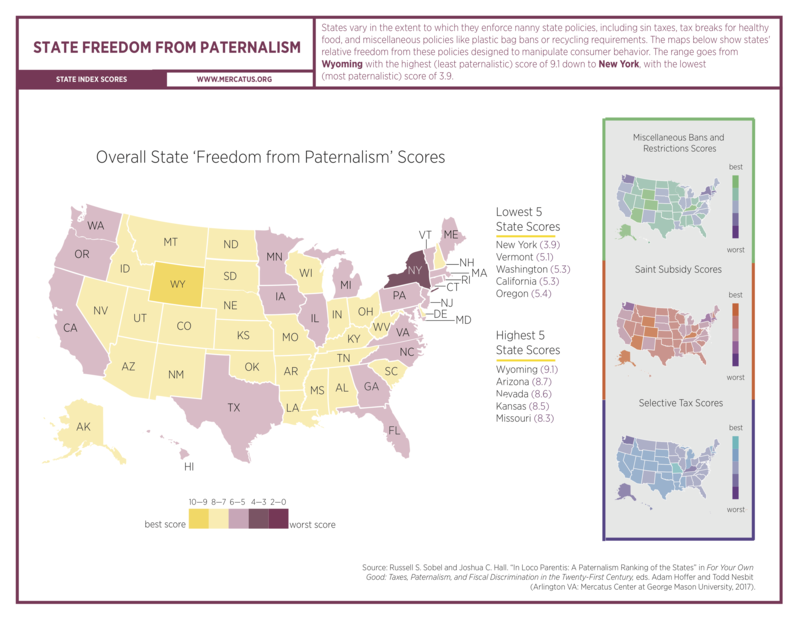 Wyoming has the most freedom from paternalism, while New York is the most paternalistic state. This ranking places Wisconsin 23rd, which is far too high, but is better than the states around us. A chapter of their report can be read here. This shouldn’t be especially surprising, given Wisconsin’s moralistic political culture and the so-called Progressive Era, the idea that government could improve man.